Posted on Thursday, November 19th, 2009 at 13:51. Microsoft Tech.Ed just asked a lot of a human body, leaving mine sick at home for a whole week. I finally found some time to complete the rest of my report on this big event. The title of this session covers the content completely. The first item Giorgio Sardo wanted to show, is what determines the performance of websites in IE. but thes operations only cause 33% of the CPU-load. 67% procent is caused by Layout, Rendering, Formatting,… of a web page. Unused styles cause performance problems. The speaker demonstrates a bookmarklet to find styles that are included, but not used on a web page. Minimize DOM interaction, because this is very expensive. this seems to be a very usefull tool. Use HTTP compression, this can be configured in IIS 7 (option enable static content compression). Combine images in sprites, using SpriteMe. Make use of Doloto: this new application from MS DevLabs creates a tree of your navigation to each single function in your application. Use Expression SuperPreview to see how pages are rendered in different browsers. Another usefull tool is Fiddler. 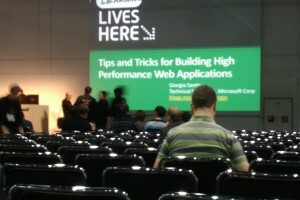 Stephen Walther is an excellent speaker, showing some great demos in this session. In ASP.NET MVC 2.0 there is a “better separation of concerns”: Use RenderAction to invoke a controller action. RenderPartial() in MVC 1.0 only generates the UI, RenderAction() invokes a controller action before rendering the UI. Model validation: decorate model classes for validation (this looks very similar to .NET WCF Ria Services).